Really pleased to be hosting a post today on my Countdown YA blog tour, especially as it's an interview with an author who was one of my favourites when I was a teen, the wonderful Theresa Breslin. 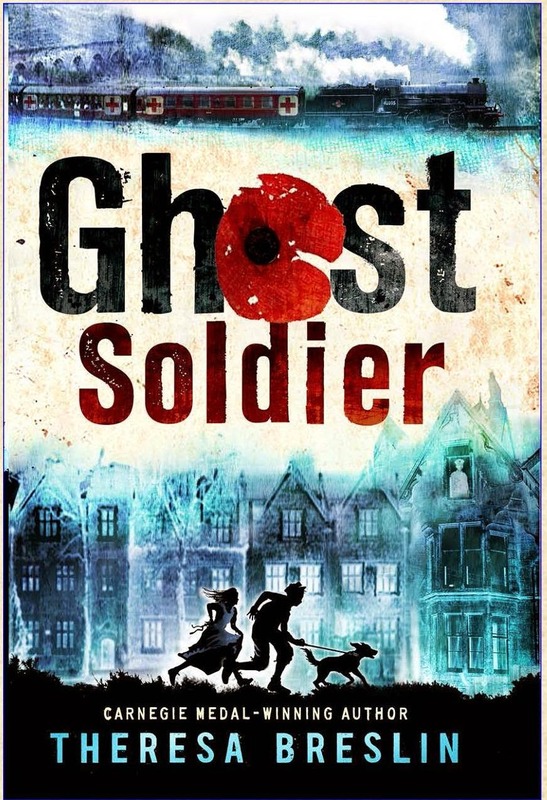 Her new book, Ghost Soldier, is stunning - and as it's set in the First World War, on the home front, it's especially appropriate that we're running it today, as we commemorate 100 years since the war started. Oh, wow, that's a scary question! I've never done that before - never even thought of doing it - and now that I'm trying to do it I can't see anything. That thought could send me to the pit of despair! Often I close my eyes and imagine my characters but never the readers. 2. One of the bits which touched me the most in Ghost Soldier was Rob and Millie's desperation for news of their father. Who's your favourite fictional father? Fathers were often absent in children's fiction when I was growing up but I am glad to say that is no longer the case. From my own childhood it would have to be Geppetto, Pinocchio's daddy, whose love for his son transformed him into a real boy. There's a lot more in that tale than the superficial Disney version. 3. In Ghost Soldier there's an abandoned house which may or may not be haunted. What's the spookiest place you've ever been to? I love exploring old graveyards, the older the better, and usually I have a little chat to the residents as I wander about. Obviously I try to make sure I can't be overheard by anyone else who might be around! I'm only recently back from France where I was taking photographs and collecting materials for my WW1 themed creative writing workshops. I visited the "Cave of the Dragon" in the area of the Chemin Des Dames east of Paris. The hillside is riddled with tunnels and caves which have markings that pre-date Christianity. Some of it has been transformed into a huge underground museum but it is also a burial site as they reckon hundreds of soldiers, Allied and German, must still lie somewhere deep in the caves. Being there was an eerie experience. 4. In addition to Ghost Soldier's publication in August, I think I'm right in saying that a previous WWI novel of yours, Remembrance, was reissued earlier this year? Why do you think World War I stories resonate so deeply with teens today? 5. You were first published just over 25 years ago, with your debut Simon’s Challenge. The publishing landscape has changed massively since then – what do you think is the biggest change? IT development and everything that comes in its wake has had the biggest impact. It's an absorbed skill for young people and quite a few I have met have published their own books on-line. .
6. You seem to be more active on social media, especially Twitter, than many of the authors who started writing at a similar time to you and are still active. What do you think is the best thing about social media, and are there any drawbacks? I struggle to keep the website up to date ( it isn't) I find Facebook a bit "lookee me, me me," but Twitter is fast and funny and full of fabulous gems as lots of people tweet fascinating things that I would never otherwise know about. I love to RT interesting things. Also I find that if there's an event on or something new coming out then there's lovely support from other writers and illustrators and folk like yourself who will help spread the word. But... There are ENORMOUS drawbacks if you are a creative write It drains energy - no doubt about it and Time goes gurgling down the plughole. So if I'm in 'writing' mode I do not connect to the Internet at all at all. 7. You’re a Carnegie Medal winner for the superb Whispers In The Graveyard and have been longlisted and shortlisted since then for the medal as well. After The Bunker Diary’s win a few weeks ago, there were several complaints about the novel’s darkness, and a few authors including Frank Cottrell Boyce and Shoo Rayner calling for separate prizes for teens and younger children. Do you think there’s any merit in the idea of separating them? I think the Carnegie is the Carnegie is the Carnegie. Bear in mind that I am a professional librarian! I'm now writing full time but at one time was responsible for Youth Library Services for a local authority and so am aware of various issues here. On Wednesday 13th August I'm taking part in a panel event called BOOKS THAT WIN at the Edinburgh Book Festival chaired by Joy Court, chair of the Carnegie Medal Working Party, so I'll have more to say on the subject then! 8. This is the second book you’ve been involved in which has featured in Countdown, as you also had one of my favourite stories in June’s War Girls anthology and took part in a fab interview then over at Comet Babe Books! Is there a difference between the way you approach writing a short story and the way you approach writing a novel? Great Galloping Galoshes! Yes, indeedy. I hate loathe and detest writing short stories. Usually I am so wrung out when I finish one I swear I'll never write another. The editor at Andersen was extremely patient as it took me ages to write SHADOW AND LIGHT. From the first word a short story has got to turn like a spinning coin, you can't meander off and indulge yourself. It's very very tight. With a book I think and then write, and write and then think, and then think and write. With a short story. I think and think and think and think and think and then I write. And then I stop and do the same thing all over again. Many times. with lots of teeth gnashing in between. 9. In that interview, you mentioned your love of travelling. What would be your dream trip? I'd love to go to Africa - for about a year or more. But I did kind of fall in love with Siberia when I was there and would like to return. The people were hungry for books. The descended like locusts on the Book Fair about 10 o'clock in the morning and by 11.30 am the place was picked clean. FYI the Book Fair wasn't due to open until noon! Fortunately the suppliers had container trucks full of back up stock parked outside! 10. What’s next for Theresa Breslin? Good luck with that, Theresa! Thanks so much for such a fabulous interview.